As you age, deciding to stay in your own home can be an expensive but necessary proposition. Despite the costs, the United States Aging Survey shows that many Americans age 65 and older say they want to continue to live in their own home as they grow older. To be able to age in place successfully, it’s often necessary to have some remodeling done in your home to make it safe for your retirement years. Consider how you might change as you grow older before remodeling your house to accommodate life after retirement. Although medical advances are keeping seniors healthy and active longer, think about the challenges your relatives have had as they aged. Your eyesight and hearing may worsen, or it may be difficult to navigate stairs, step over a threshold or climb into a bathtub. You could need a walker or a wheelchair to get around, and if arthritis is in your gene pool, you could have difficulty grasping and turning doorknobs. Falling is another concern as we age and grow less steady on our feet for many reasons. The U.S. Centers for Disease Control and Prevention has pinpointed some conditions that contribute to falling. These include lower body weakness, home hazards such as throw rugs or clutter, use of some medicines like tranquilizers, sedatives or antidepressants and vitamin D deficiency. Even some over-the-counter medications can make you feel less stable on your feet. The good news is that price tag on most remodeling projects is under $10,000, which is still far less than what you might spend on a nursing home. LongTermCare.gov reports that the average cost for a semi-private room in a nursing home is $6,844 per month. The cost for a private room is $7,698 a month, and a one-bedroom unit in an assisted living facility runs about $3,628 per month. What Remodeling Do You Need to Age in Place? 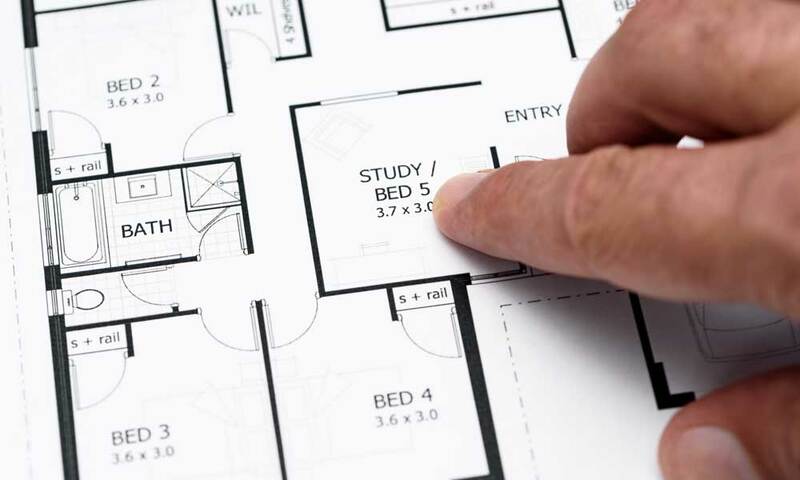 Determining how you need to accident-proof your home is necessary before beginning the remodeling process. Evaluate how you will live in and use your house while reflecting on the challenges you expect in your later years to discover which areas pose the most potential for danger. It’s important to think about different ways you can use the space in your home as you age. You might not need as big of a house as you think. 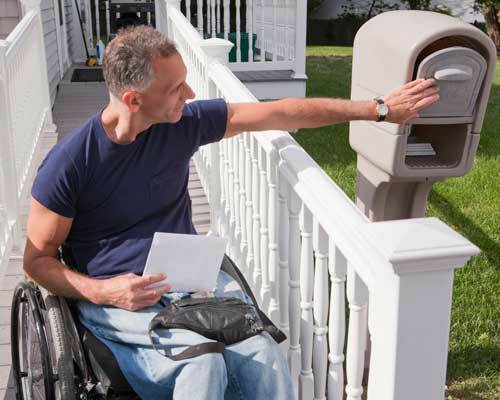 If you need help with identifying medically-required home modifications for your safety, Medicare Part B will likely foot the cost of an occupational therapist who can evaluate your home and determine what alterations are necessary. If you have Medicare Part C coverage, this supplemental insurance may pay for the cost of renovations. Also, the National Association of Home Builders certifies aging in place specialists trained in strategies and techniques for designing and building aesthetically pleasing, barrier-free living environments. The cost of an evaluation is usually paid by the hour or a flat fee per visit or project. Prices vary according to the contractor’s background and the demands of the project. The NAHB offers a certified aging-in-place specialist directory. We’ve also put together an aging in place remodeling checklist to help make sure you’ve covered all the areas of your home. Falls are a leading cause of death and injury for older Americans. Many of those injuries — about one-third — take place in the bathroom. One way to reduce slipping or falling on a wet bathroom floor is to replace the floor with a nonslip surface. The cost of this project professionally installed runs from $6,400 to $11,000, depending on where you live in the country. If you choose to do this project yourself, a variety of materials such as rubber flooring, slip-resistant vinyl, or cork offer traction or cushioning and cost less than $3 per square foot. Non-slip rugs are another option and generally cost about $10 to $15. A slip-resistant bath mat with suction cups is only about $10. A non-slip spray is between $20 and $30, and water-resistance adhesives go for about $40 to $50. Making a bathroom safer may require a walk-in tub or shower. Both come with low entry points that mean a person can walk into the tub or shower. The cost of installing a walk-in tub varies from $3,000 to $15,000. The national average price of a walk-in whirlpool tub including installation is between $5,000 and $7,000. The national average for the cost of putting in a walk-in shower is $3,321. The Americans with Disabilities Act (ADA) states widening doorways to at least 32 inches to make room for a wheelchair or walker will ensure you can continue to have easy access throughout each level of your entire house. Costs for widening doorways varies drastically depending on the type of door replacement and hardware, and whether the contractor needs to move electrical wiring or plumbing. Doors that unlock with a key fob cost several thousand dollars but can pay off due to the increased mobility offered to someone in a wheelchair. You will pay from $200 to $7,000 for a wider entry door. Putting in a permanent ramp that lets you enter your home using a walker or wheelchair can make your daily life more manageable at the cost of about $874 to $1,751 when done by a professional. The price of a ramp will vary according to the type of materials used and the cost of labor. A ballpark estimate is $100 to $250 per linear foot. You can calculate based on the standard ramp size of 30 feet long, 30 inches wide and 30 inches high. A portable ramp without installation can cost as little as $60 on up to $800, although they aren’t as aesthetically pleasing. Someone who can no longer climb stairs may need a stair lift to access upper levels of a house. The price is in the $3,000 to $12,000 range and can go up to $20,000. Installing handrails in a stairway is about $100 per foot with a total cost of $700 to $1,200 depending on your stairway. Installing an elevator may be needed if your stairs can’t accommodate a chair lift. Having an elevator put in costs about $33,000 to $100,000. Pain in your hands can make even the smallest tasks a challenge. Changing out faucets to a model with lever handles can make them easier to turn for someone with arthritis or who lacks muscle strength. The price can run from $90 to $550, with the most common range being from $154 to $332. You will spend between $800 and $1,400 to increase the width of hallways to accommodate wheelchairs. However, the price can increase significantly if you need to do any substantial work along the lines of removing or rebuilding cabinets, taking out light switches, changing electrical components or changing doors. When structural elements come into play, it can cost in the $30,000 to $40,000 range to increase a hallway by a foot. 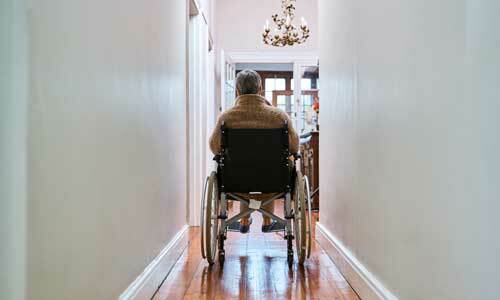 The ADA states the minimum width of a hallway should be 36 inches for a wheelchair to get through. Spring cleaning won’t seem like such a chore for a person with lagging muscle strength if they can more easily open and close windows. Installing a standard 36 x 60 double-hung replacement window is generally in the range of $550 to $1,050 for each window. Size, type of materials and other factors contribute to the cost. Remodeling a bathroom may be the most important project to consider as you age. The costs range from $2,500 to $24,800. The final price will be determined by the size of the room, whether or not you have to change out fixtures or redo plumbing and electrical. 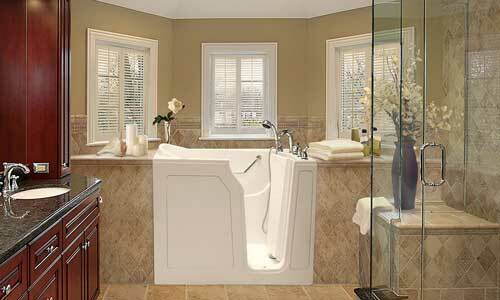 Big ticket items for a bathroom remodel are walk-in tubs and showers. Seniors who have trouble bending may want to install higher countertops or a more shallow sink. On the other hand, those who are in wheelchairs may need to have cabinets and counters lowered. Consider your needs before making any permanent changes. The cost of making your kitchen more accessible is in the $15,000 to $20,000 range. This includes having a contractor lower your countertops.